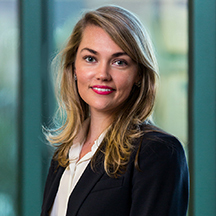 Alexandra Deane Gabel is an associate with the firm and has practiced in Naples since 2012. Alexandra is a member of the firm’s civil litigation and business law groups. Prior to joining the firm, Alexandra practiced in securities arbitration and real property transactions and land use with another Naples law firm. While in law school at Vanderbilt University, Alexandra was an active board member of Moot Court and won the Lightfoot, Franklin & White Best Oralist award for Moot Court competition. She served as a judicial intern for Florida First District Court of Appeal Judge Lori S. Rowe. Alexandra also holds a Florida Real Estate Sales Associate license.